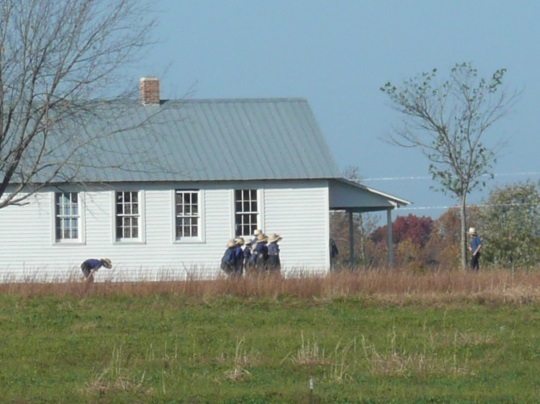 Do Amish women work? Seems a silly question, with their full-time jobs as mothers, homemakers, and all the other roles they take on. What I mean is, do Amish women ever work away from home in an “outside job”? The answer is yes. Younger or unmarried Amish women are more likely to have outside jobs. Generally, those married women with young children are going to be at home. But some Amish mothers do have occupations, part-time or otherwise. The jobs Amish women take on are usually, though not always, different from those men typically do. Read on to learn about five of those jobs. 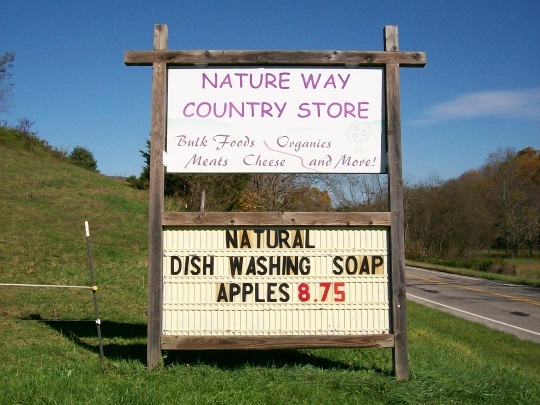 Amish women are quite active in business. Some help run family businesses, but quite a few have their own shops–variety stores or fabric shops being two common examples. Quilting is a popular occupation, be it creating a full quilt, or helping in part of the process in an “assembly-line” style arrangement, for example just quilting the tops. 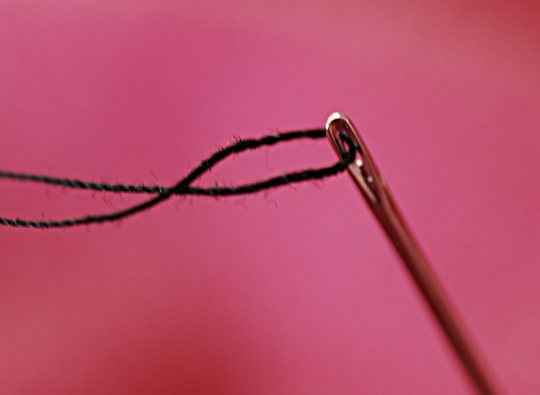 Amish women may do other types of seamstress work. The wife of a friend sews costumes for an outside company in the family basement. 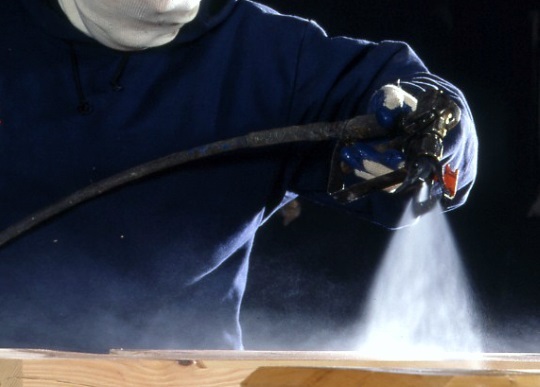 Furniture finishing is the process of applying the final protective coating over the stained piece of furniture. This is done using a spray tool to evenly apply a finish onto the surface. This is one that’s probably not too common, but I have been told by at least one Amish furniture business owner that he prefers women for this job. In his opinion they have better finesse at applying the coating. His challenge with hiring females is turnover, of course, as marriage usually means leaving the job behind. Female teachers far outnumber male teachers. There are different reasons for that. Young men are more likely to gravitate to higher-paying, manual labor and craftsmanship jobs. Teaching is typically an occupation for young women, and so also can have high turnover for the reason mentioned above. Though, some women do make a long-term career in the classroom. If you’ve visited an Amish-style or PA Dutch restaurant in an Amish community, there’s a decent chance you had a young Amish lady as your waitress. What other jobs, common or unusual, have you seen Amish women do? Amish women have alot to do at home&around the community, I really love their way of life&I wish I could of joined the church&/or their community.I hate this day&age were living in&I’m so willing to give up all modern conveniences. (I surely can do with out)anyway most women today are lazy&don’t do anything.Amish women&the people are wonderful&hard workers&appreciate the little they have (plain is great)&Having God&prayer.I will always have respect for amish people. I was raised to work hard and my Mother worked hard to . We lived on a farm and did the same work as Amish women do. My Mother held an out side job as well. Please don’t call us lazy. I quit my job, because my husband is very sick and can’t be left alone, nor can I afford to hire someone to help. We make it, its hard, but were ok. people on the outside are not treated very well on your post. As for people wanting to join up with the Amish, I see nothing wrong with it, but are you ready to give up your family, friends and celebrating our holidays? How about joining the US armed forces, which we so strongly believe in? if you strongly believe in joining, I only wish you much happiness. How much does the average Amish School Teacher make per year? I was wondering what the average Amish woman makes per hour at jobs for the Amish and for the English? I especially would like to know how much the Amish School Teachers make per School Year both woman and men? Maybe we can get some current insights from Rebecca or another teacher on this. Generally it can vary by community with wages lower in the plainer communities. Men tend to be paid comparatively more for teaching jobs, in part b/c if they have a family they are usually the main breadwinner. Mark, you wrote you used to teach school. Do you care to share your input on this one? I’d be interested in knowing how teacher’s wages compare male to female. I found an article from Pathway Publishing saying teachers salaries varied but they usually averaged $25.00 per day can anyone confirm that. Much more than that nowadays, anyway here. We usually get paid per month and it varies a lot from community to community or even school to school and we usually don’t make it public knowledge even among ourselves. The price is agreed upon before you promise to teach, but you most definitely don’t teach for the money. Looking for an Elderly Caretaker for Mother. We are located in Columbus, Ohio and are looking for a caretaker for my elderly Mother as a possible option to a nursing home. My Mother had a stroke in 2013 but can do nearly everything for herself but can be unsteady and. She loves company, to make quilts and sew but is unable to do the fine quilting anymore. We are looking for some suggestions as to who we might be able to contact if you know the Ohio Area. The house is very nice and simple in a safe, good area of town. Please point me in the correct direction. On wages for other jobs: I only have part-time summer jobs, so I normally don’t make as much as I would with a full-time job. $9.00 to 11.00 is common for my summer jobs. To clean house I got $50, but that only took me half a day. To mow an Amish single lady’s yard I got $15 -$20. If you work somewhere for a couple years and do a good job you can make more, but money isn’t everything. Money isn’t everything as you said. I’ve changed jobs in the past to make more money and regretted it! I have purchased woven rag rugs from two sisters for years. One is single and has her shop next door to the “big house” and cares for her aging parents. If she isn’t in the store when you walk in, you browse until she notices a car parked out front and will run over to wait on you. The married sister doesn’t advertise or have a store, but rather word of mouth and you go in the house and look at her rugs for sale. It depends on what time of year it is and how busy she is with her family duties, whether she has had the time to weave rugs. It’s a hit and miss thing. Because we are not strangers at either place sometimes all we’ve purchased is conversation! The last time we were at the store was kind of a sappy visit when Katie talked about the condition of her aging father. We’re not just old customers, but rather old friends after all these years of stopping in to shop and visit. The link to Beth Grabill’s dissertation did work for me–I’m using Google Chrome. What are you using, Colleen? Could it maybe be a browser issue? 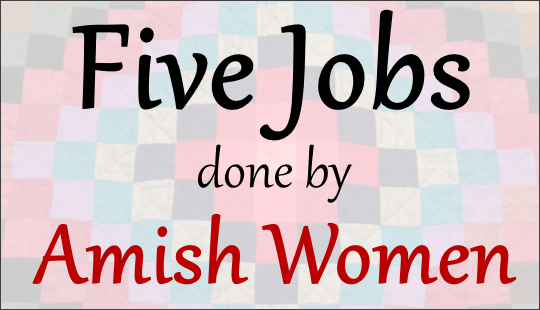 Amish women only do 1 job…. That one job is the job of doing EVERYTHING!!! Is that meant to be a joke, yes and no. Amish women pitch in all of the time to fill the gaps of the things the Amish men can’t do or won’t do. Me thinks that English women often do the same. In a simpler time – back in the 40s – my mother had regular customers in town for her dressed geese and ducks and chickens. I remember being with her when she delivered several at the back door of a local bank. I have no idea what she charged. My older sisters in the 40s worked at a ‘glove factory’ – I have no idea what they did – for their own money. I was too young and, except for babysitting neighborhood kids, never had a job while I was Amish until I was 16 and did housework for a Mennonite family up the road. They paid my parents $7.00 a week, I believe. A recent tour of the Jayco RV factory in Indiana revealed at least one young Amish woman at work in the cabinet shop. We didn’t go into that area, but I’d guess she might be doing finishing work. Also, a film we watched before the tour showed an Amish woman applying “Jayco” stencils to the exteriors of completed RVs. I have several friends in Northern, IN that work at trailer factories. Around here many Amish girls also work in the stores, Keim lumber, Weaver Leather, P Graham Dunn, besides those mentioned. 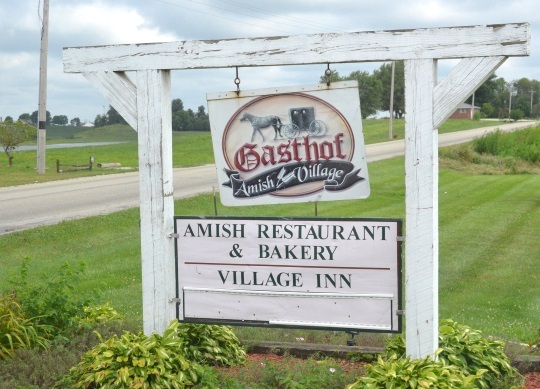 Several Amish girls work in a Mennonite-owned bakery near here. When I lived in Virginia, it was easy to drive to Dayton and get my prayer kapps with no problem. Now that I am widowed, I moved back to my home on the Delmarva Peninsula and have been unable to find any local stores that sells them. My remaining two kapps are so filthy, it’s embarrassing to wear them; but I do. It’s sad to say, but only myself and the Pastor’s wife wears them anymore. I’m praying hard that when my new church has its first Love Feast, that I will see many more. Is there any women, that you know of, in the Dover Delaware community that wants to earn some pocket change? My kapps are Mennonite/Brethren in design, very plain…no embellishments, but I would accept lace for weddings. They are all made of simple net material. I also need a good black net for funerals. Right now I use Catholic lace coverings (black and white), for both weddings and funerals, but am not comfortable with it. I’d love to see any “modern woman” do the kind of work that these Amish ladies do… they’re amazing!